It demands attention. The sitting posture and the way you hold the electric tool, all that demands mindfulness. This is not some meditation technique. It is how you engage in the encaustic art, better known as batik art. That explains a comprehensive picture of the Galeri Batik Jawa, a collection of natural indigo batik – hand-painted batik using 100 percent natural dye from Indigofera tinctoria which yield attractive shades of blue that are applied into fashionable women’s and men’s wear. 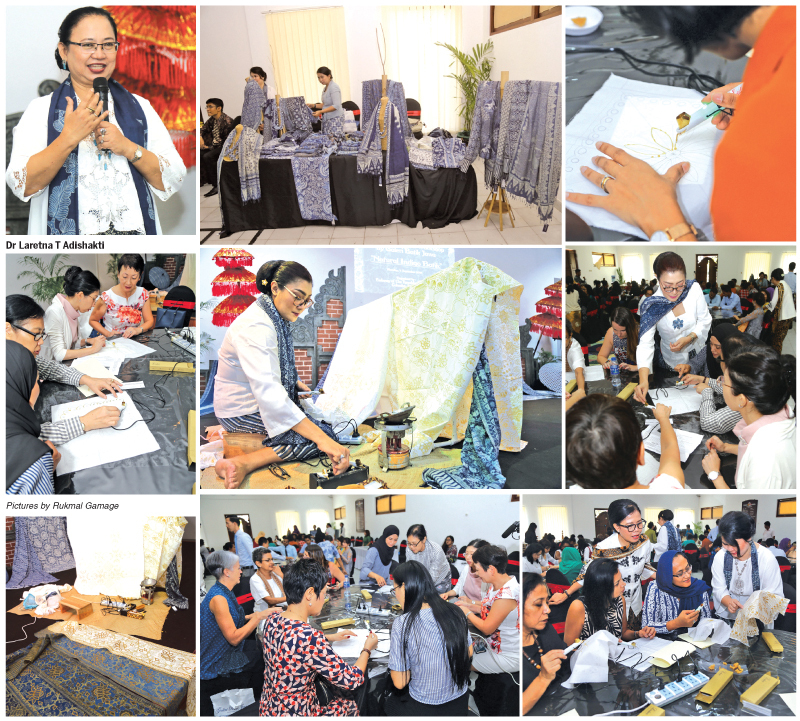 Dr Laretna T Adishakti is a lecturer and coordinator for the Center for Heritage Conservation, Department of Architecture & Planning, Faculty of Engineering, Universitas Gadjah Mada in Yogyakarta, Indonesia, recently held a Batik workshop to a Sri Lankan gathering. The workshop, organised by the Indonesian Embassy, provided the Sri Lankans with an opportunity try a hand on this indigenous Indonesian art. Adishakti received her doctorate in engineering from Kyoto University (1997) while her master of architecture degree is from the University of Wisconsin, Milwaukee, USA (1988). Currently, she facilitates as co-founder and praesidium, Indonesian Heritage Trust; Board of Expert, Sekarjagad Batik Society, and co-founder of the Jogja Heritage Society. She is also the director, Natural Indigo Batik Research and Design, Galeri Batik Jawa Indigo Co., Ltd.
“The indigo batik is used following the fermentation process of indigo leaves. It is a natural dye without any synthetic chemical, leaving no hazardous waste that could pollute soil and water, “Dr Adishakti explained. One of the oldest natural dyeing colours, Indigo has been used for well over two millennia. Also baptised as the colour of the kings as well as the king of colours, this unique colour produces a natural blue colour. The colour is unique in its own right owing to its calmness, vividness and wear-resistant capacity. It can also be combined with other natural colours to get a unique composition of colour harmony. Anyone fond of unique handmade items and capable of appreciating its beauty will naturally fall in love with the products made of Indigo batik. The showcase of Indonesian cultural heritage at the workshop beckoned for the environmentally friendly process. The products are creatively designed and processed by hand, which is made with indigo paste and Javanese traditional patterns painted on various materials, such as cotton, silk and natural handwoven fibre with casual-contemporary style. Batik Indonesia has earned the reputation as UNESCO masterpieces of the oral and intangible heritage of humanity. Jobja, the city where the batik has originated, is designated as World Batik City. The power of Jogja traditional pattern calls for the contemporary fashion while Galeri Batik Jawa’s mission stands for its achievements across the globe. Dr Adishakti also traced the etymological roots of the word Batik. Originally termed as Pa-Tika which equals giving an order to draw or paint, it later came to be pronounced as ‘Ba’ and hence batik in the east and central Java. Tika is a sacred painting on the pandanus petal, called pudak, as the media. “Batik is the Rintang Warna in Indonesian which means wax-resist dyes technique process for making designs on media by handwriting. Tulis is hand-painted by women whereas Cap stamped by men. It is Javanese traditional Batik,” Dr Adishakti remarked. The well-rooted maxim of Indonesia, Karena nila setitik rusa susu sebalenga, notes that one drop of indigo stains the whole pot of milk. It seems to be the undercurrent philosophy that dominates the Batik art. Reviving such local wisdom is instrumental in maintaining indigo as environmental friendly fashion artworks and industry. The Batik art prevalent in Indonesia is rich in symbolism related to social status, local community, nature, history and cultural heritage. It provides Indonesian people with a sense of identity and continuity as an essential component of their life from birth to death. It contributes to ensuring the visibility of intangible cultural heritage at the local, national and international levels, raising awareness about its value and motivating the practitioners of the younger generation. Various actors such as governmental and non-governmental institutions and community-based associations have jointly carried out safeguarding. Yogyakarta Batik maintains the authenticity of local wisdom as shown in the tradition and culture of batik and the way it used. Batik is a Rintang Warna (colour blocking) wax rest dyes technique process for making designs on media by handwriting, using canting and stamp. Batik has also been used in a life cycle of Javanese people and its performing arts. Yogyakarta continues to preserve the authenticity of batik. Batik inherited and carried out from generation to generation (transgenerational) while using the Rintang Warna process on hand-painted stamped batik. The conversation of Yogyakarta batik has not only been in the traditional form of Jarik sarong or scarf but has also innovatively and creatively transformed into a variety of development. The villages in Yogyakarta later became the centre of Batik, many of which have centuries of its existence. With traditional markets are scattered in the cities and villages, Yogyakarta has faced a gradual yet steady evolution. The massive expansion of the batik shops indicates the trade and home industry condition of Yogyakarta. Instead of providing for local community needs, batik is now becoming a major tourist attraction in Indonesia.